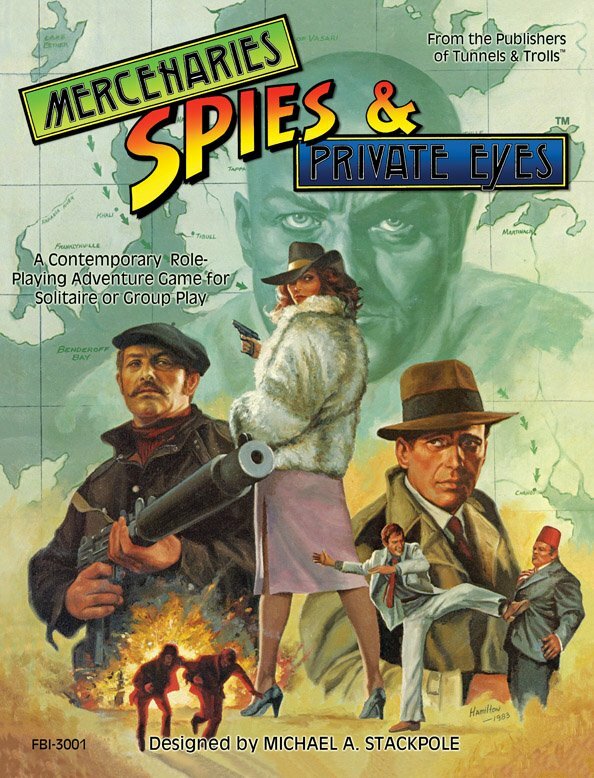 Flying Buffalo announces new edition of its classic Mercenaries, Spies & Private Eyes RPG – via a Kickstarter. NEW – The Combined Edition of Mercenaries, Spies & Private Eyes – Some of you may be unfamiliar with this classic espionage Role Playing Game. Written by best-selling author Michael Stackpole back in 1983 when he was an employee of Flying Buffalo, this game is based on the Tunnels & Trolls rpg system and allows players to adventure on Earth from the 1800’s to the 1990’s (and beyond). It was meant to let you play in Sherlock Homes Victorian era, Indiana Jones Pulp adventures and James Bond cold war Spy missions. Several Adventures (both for gm and solo play) were published for MSPE as it came to be known. There were two printings of the rulebook, the first edition, by Flying Buffalo and the second edition by Sleuth Publications in 1986. The books were very much the same, but there were differences. The Buffalo edition had a gorgeous color cover and painting, there was a section in the book for how to play T&T using MSPE and there was some different art and a full page character sheet. The Sleuth edition had a plain black & white cover, was missing the T&T section and had optional rules for aging, 13 pre-rolled characters (with art by Liz Danforth) a special folding character sheet, some new art and some corrections to the rules. The original MSPE book(s) have been scanned, restored and enhanced by Flying Buffalo’s Art director Steve Crompton, who has also created some new art for the rules. Flying Buffalo now has a Kickstarter for the printing of a combined edition of MSPE that will include the corrected rules and all the different material from both editions of MSPE collected into one book. They are also going to add new rules material, some of it by Mike Stackpole. The rules will be printed as a trade paperback 8 x 11 inches, with a color cover and black and white interior pages. For an extra $7 you can even get your copy of the rules signed by author Michael Stackpole. The kickstarter is active until March 26th 2019, so if you are interested, now is the time to take a look. The link to the Kickstarter is below.